It’s always exciting to see the Water Rocks! messages and lessons create a ripple effect to reach well beyond the direct activities of our small team. In Carroll County, under the guidance and creative leadership of Anjanette Treadway, human services program coordinator in the Carroll County Extension Office, the ripples are gaining momentum and turning into a tidal wave of activities for elementary and middle school students across the county. Anjanette is responsible for supporting STEM (science, technology, engineering and math) education for kindergarten through third grade in county schools. She is also the “conservation education” champion for all students up through the sixth grade. She uses the Water Rocks! programming and materials to make waves in classrooms and beyond. Two major events that she produces in Carroll schools are a field day for third-graders, and a sixth-grade environmental field day. During the summer of 2018, Anjanette also coordinated a six-hour day camp program open to all fourth- through sixth-grade students in Carroll County. She anticipates continuing this in future summers to provide education and outreach to students regarding the importance of environmental awareness and conservation. The third-grade conservation field day has become Water Rocks! Day, comprising hands-on outdoor activities and games as well as participation from key specialists and teachers. The next Water Rocks! Day will be held in May 2019. The introductory lessons get students up and moving as well. The students are outside, running, getting dirty, investigating such things as where water will run off from the playground and other tangible lessons which tie in to the classroom instruction. On Water Rocks! Day, Anjanette sets up many of the fun Water Rocks! activities including Biodiversity Jenga, Creature Cache, Habitat Hopscotch, Wetlands Bingo and the Poo Relay. The Water Rocks! team presents its We All Live in a Watershed module, and other specialists present related material. In addition, the students participate in nature walks to extend the lessons beyond the classroom to incorporate their own observations. For the sixth-grade Environmental Field Day, the lessons are more intensive, incorporate water quality topics as well as the core conservation message and involve guest presenters. At the most recent event, presenters included the naturalist from the Carroll County Conservation District, a speaker from Saving Our Avian Resources (SOAR), a raptor rehabilitation center, the Water Rocks! team from Iowa State University, and teachers – who were delighted to get a chance to step out of the classroom and teach in a different style. Starting in 2018, the Environmental Field Day now also includes a Water Rocks! Assembly program with live music and skits. “The field day started with different presentations and lessons, leading to the capstone of the day, a ‘rock concert’ assembly program. Of course, it’s not all rock music, but the atmosphere among the performers, kids and teachers sure made it feel that way,” she commented. Looking to book a Water Rocks! Assembly in your neck of the woods? Limited openings remain for May, and we are also booking for the summer months! Today’s guest blog post is provided by Joshua Harms, part of the Iowa AmeriCorps 4-H Outreach program, serving with Water Rocks! in 2018-19. As a continuation of my monthly blog series highlighting our educational approaches working with youth, today I will be explaining our “Dig Into Soil” module which we present in classrooms with Water Rocks!. We start off our soil module with a trivia question as we always do. Next we explain the definition of natural resources and then ask students for some examples. Then we let the students know that Iowa has some of the best soil in the entire world. Our next step in this module is to define soil – how is it different from dirt? Soil is alive! It supports us here on earth and we could not live here without it. Next we show the students a poster with pictures of different items to help them guess the different ways soil is used, including food, clothing, habitat, and filter (filtering our water). Now that we have explained some of the very important things soil does, we move on to see how soil is formed. We go old school for this part, using a felt board to help show the different layers of soil. This includes bedrock, subsoil, top soil, many different species that live in the top soil, and many different things that grow out of the soil. We continue by explaining that soil is endangered here in Iowa because it takes the earth 500-1,000 years to form 1 inch, but we are losing that inch in 20 years. The reason we are losing soil so fast is because of erosion, the process of soil being moved by wind and water. Soil is most valuable in place, in our fields and gardens – it becomes a problem when it makes it to the water. There are a few very important things that should be done to protect the soil. Keeping the soil covered is key, which can be done through mulching, planting trees and grasses, plus farmers can do no-till and cover crops. Next we transition into a game that shows how important soil is, considering that nearly everything that we use comes from the soil. The game is called Six Degrees of Soil. In this game, we give the students an item and they have to work together in teams to figure out how to get from soil to said item in no more than six steps. An example that always makes students laugh is underwear. One would start with soil, next plant some cotton, then pick the cotton, then process that into thread, and lastly send it to a factory so they can sew it into underwear. The last important topic we cover related to soil is decomposition. This process takes place when the different organisms break things back down into soil. We explain that certain items get broken down quicker than others. To help the students understand this topic even better, we play another game. In the decomposition game, we give the students 5 different items and they must put these items in order from fastest to slowest in terms of decomposing. We wrap up by asking the students for ways we can help protect the soil and protect the larger environment around us. Common conversation points include planting grasses and trees, no-till farming, reusable water bottles, taking your own bags to the grocery store, setting up a compost pile, organizing a trash pick-up day, etc. Finally we finish with the same trivia question that we asked at the beginning of our presentation. If you’ve been to an Iowa county fair or attended an Iowa State University (ISU) extension field day covering water quality, conservation, cover crops, edge of field practices or a range of other topics, there’s a good chance you’ve seen or even visited a Conservation Station operated by Water Rocks! and Iowa Learning Farms. Last summer we hit the milestone of attending all 100 county fairs in Iowa – (yes 100, Pottawattamie County holds two.) The trailers also make appearances at community events, farmer’s markets and other settings. The Conservation Stations are traveling resource centers and classrooms, staffed by ILF and Water Rocks! team members and interns, providing water quality and conservation education and outreach activities built on a foundation of science, research and best practices. These events also provide great learning opportunities for the team to sharpen trailer pulling and backing skills. The idea for the first Conservation Station was germinated in the early years of Iowa Learning Farms (ILF) – which is celebrating 15 years in 2019. The precursor was a trailer equipped with a simple rainfall simulator for demonstrating soil erosion. It was a good start, but frankly, it was a limited demonstration and the team quickly realized that they needed a more sophisticated rainfall simulator. In addition, ILF saw the potential to expand its impact by providing a broad canvas for education through visual, interactive and multimedia displays. The trailer, dubbed the Big Conservation Station, allowed space for an improved rainfall simulator as well as a walk-through learning lab. To facilitate use in different environments such as field days, outdoor classrooms and county fairs, the trailer accommodates interchangeable displays. Inside the learning lab, visual and multimedia presentations are designed to engage audiences in conversations and to elicit questions about conservation practices. The learning lab was updated in 2018 to incorporate mixed-media artwork and enhanced messaging with the purpose of eliciting visitors’ hopes for Iowa. ILF faculty adviser Matthew Helmers developed the new rainfall simulator which more accurately models both surface runoff and subsurface flow or drainage in tiled environments and uses soil blocks extracted from field environments to best parallel actual soil conditions in Iowa fields. “The complexity of the new rainfall simulator was a challenge, but it also enabled us to tell a much more realistic story that farmers in Iowa could relate to,” noted Staudt. A smaller trailer referred to as Conservation Station 3 was built specifically for outdoor classrooms and other youth activities. Along with a rainfall simulator, it is also equipped with the space to carry enough tables and chairs for students as well as a full complement of displays and activity resources. In 2018, the original rainfall simulator trailer (which we called the Lil’ CS) was redesigned to become the Conservation Station on the Edge, addressing best practices for nutrient mitigation at the edge of tile-drained fields. Equipped with working saturated buffer and bioreactor models, this trailer takes the story of nutrient reduction to a deeper level. The demonstration stations allow the audience to see what happens within structures –that when implemented in a field are completely underground and out of sight. Each Conservation Station includes interactive demonstrations that appeal to all backgrounds, ages and walks of life. Games such as the Poo Toss tend to appeal to youngsters but provide tangible lessons about waste runoff that pertains to everyone –whether they live on a farm or in a city. The Watershed Game is another highly visual interactive game that helps make the concepts of a watershed and how pollution moves with water easy to grasp. The Conservation Stations are used April through October. Check out the Water Rocks! website to request a visit (requests for summer events are being accepted now!). In most circumstances, a Conservation Station can join an event at no cost, due to the generous funding received from our partners. April 4, 2019 astaudt	conservation, Conservation Station, education, Iowa Learning Farms, Iowa State University Extension and Outreach, natural resources, outreach, rainfall simulator, soil, trailer, water, Water Rocks! Biodiversity Bonanza is another one of our awesome classroom presentations with Water Rocks!. As we start all of our presentations, we introduce ourselves and then we ask the students a (pre-assessment) multiple choice trivia question: “What is biodiversity?” After everyone has answered the question, we then explore the term biodiversity, asking the students to break the word into two parts, bio- and diversity. When the students define what bio- and diversity are, we then put the full word back together, explaining that biodiversity is all the different living things in a certain area. We then transition to another important science term, ecosystem, which is a community of living organisms and their environment. At this point, it’s time for another game, our ecosystem guessing game, where students identify ecosystems from around the world. After the game, we define the next amazing science term which is niche, defined as the specific job that each creature does within the ecosystem. We then continue by asking the students what it would be like if everybody in their school did the same job. The answers are usually like it would be boring or maybe a bit crazy. A diversity of niches keeps a school operating properly, and the same holds true for ecosystems! Then we play another guessing game where we show them a poster with a zoomed-in picture of an airplane wing. Students must try to guess what they’re seeing. After they eventually guess it, we then ask them what would happen if each of the rivets were a different species and what would happen if the rivets were to be pulled out one by one. The wing would eventually collapse, which ultimately represents the collapse of the ecosystem. Next we use a banner to show the students the trophic level pyramid. After we explain the pyramid, we play a game of Biodiversity Jenga. In this competitive game, the Jenga blocks are painted in different colors that match the colors of the previously seen trophic level pyramid. We then pull situations out of a jar that determine which blocks are to be pulled out each round. It’s survival of the fittest – which team can keep their ecosystem standing the longest? We continue the game until one of the Jenga towers has fallen. We then recap some of the situations that took place during the game. We want to be sure that students are thinking about biodiversity right here in Iowa, not just faraway places like the Amazon Rainforest, so we like to bring local species and examples into the conversation. In particular, we focus on the Topeka Shiner, a native fish (endangered species) whose habitat has been altered. They prefer to live in oxbows, with slow-moving water and surrounded by trees and other plants that keep the water temperature cool. Yet many of the oxbows have gone through a process called channel straightening, which makes the living conditions much harder for the Topeka Shiner. So to allow the students to walk a mile in the Shiners’ shoes, we play a game called Musical Oxbows. This game is very similar to musical chairs except instead of using chairs we use carpet squares, painted to represent the meandering bends in rivers. This game also has situations that affect the available habitat for the Topeka Shiner – each round, a new situation is read which means 3-4 habitat spaces are removed. When the music stops, Topeka Shiners must find a spot in the oxbow or they are eliminated! As this game continues, eventually there will only be a couple Topeka Shiners remaining and then the game is complete. Again, we ask the students to recap the different situations that affected the Topeka Shiner, to help solidify those concepts in their minds. The last few things that we talk about are few different solutions/ideas of what we can all do to protect nature around us. Lastly, we have them answer the same trivia question that we asked at the beginning of the presentation, which helps us to evaluate our effectiveness in the classroom. We then send the students on their way and reorganize our posters, rebuild each Jenga tower, pick up Musical Oxbows, and more — resetting for the next class which usually starts in just 3-5 minutes! As a continuation from last month’s blog, I will be explaining another one of our great modules with Water Rocks!. Our presentation over wetlands has many interesting and important facts along with a few games as well. The module is meant to feel like the students are on a game show and we are their game show hosts. This presentation, like all the others, has been fine-tuned by our team to make it run super smoothly in the classroom with elementary and middle school students. Our Fabulous World of Wetlands module starts with an audio “field trip,” where we have all the students close their eyes as we play some sounds from out in nature. We then ask them what different sounds they heard. After they have given us some of the different creatures they heard, we ask them where they think the sounds were recorded, hoping that they eventually answer wetlands. We then ask them to answer a trivia/evaluation question to establish their baseline understanding of the subject. We then continue into our first game, a guessing game in which the students have to try and guess what the three main characteristics of wetlands are (hydric soils, presence of water, and water-loving plants). After the students eventually get all three things, sometimes with the help of some hints, we move on to show them three objects that represent the three main jobs of wetlands. The first object is a coffee filter and we explain that wetlands filter the water and leave it cleaner after it passes through the wetlands. The second object is a sponge and we explain that hydric soils store water like a sponge would if it was dropped in a bucket of water. The third and final object is a small house, which we use to explain that wetlands are a habitat to many different creatures. After we get done explaining the three jobs we have the students repeat them to lock the knowledge into their brains. We then transition to talking about some certain creatures that rely on wetlands, particularly migratory birds and butterflies. We ask the students to think about if we were all to get on a bus and take a long journey down to Texas, what would be some reasons that we would stop on our journey? They usually answer with things such as food, water, bathroom, sleep, etc. We then explain that for those same reasons that we would stop, birds and butterflies need those same things and they stop at wetlands to take care of all of it along their journeys. This leads us into the next game which is Habitat Hopscotch. This game involves different states that are on the birds’ and butterflies’ migratory paths, as pictured above. But there is a twist—there are some situations that remove wetlands in certain states, which means we remove that state from the game. We then go through all the situations one-by-one, and by the end of the game, there are only three of the original ten squares remaining. That means there are not many wetlands left for the birds and butterflies to stop at! After the completion of Habitat Hopscotch, we show two maps of Iowa, one of what Iowa looked like 200 years ago and the other one of present day Iowa. What we are showing the students is that our state used to be almost all prairie and wetlands but now the state is mostly covered by corn and beans. We then let them know that 90% of our original wetlands have been converted into other things. We also tell them that 99.9% of our state’s prairie land has also been converted. But it’s not all bad news—there has been good work with farmers to restore both prairie and wetlands on part of their land, which is great for all the creatures that call wetlands home. This leads us into our game of Wetlands Bingo, which allows the students to see many more of the creatures that live in wetlands. After each wetland bingo, we ask that student a trivia question that gives them a chance to win a prize. When we have had multiple winners, we then finish with the same trivia/evaluation question that we did near the beginning of our presentation. We also leave each classroom teacher with a set of Wetland Bingo cards, so they and their students can continue learning about the Fabulous World of Wetlands and all the amazing creatures that call wetlands their home! Both Iowa Learning Farms and Water Rocks! owe a lot of their successes over the past decade to the energy and enthusiasm of student Water Resources Interns. Each summer the young people in these positions have become the faces and voices of water and land resource management, conservation, and agricultural practices which benefit Iowa’s environment. The programs are closely affiliated with the highly-regarded Iowa State University (ISU) Department of Agricultural and Biosystems Engineering which provides research opportunities as well as much foundational science for the outreach efforts. Interns come from different degree programs, backgrounds and even states. (Know a college student who might be interested? Applications are open now through Jan. 31 for our 2019 Water Resources Internship Program!) The common thread among them is enthusiasm for engaging with members of the community through different learning and demonstration opportunities. Forty-five individuals have served in this important role over the years. We asked them to reflect on what they gained and learned from the experience, and were quite pleased with the responses. From a relatively small beginning as student research assistantships in 2007, the internship program provided resources which enabled Iowa Learning Farms to respond to research needs, programming opportunities and expansions of outreach. From humble beginnings in 2007 with a single trailer-mounted rainfall simulator, to the addition of a second and the launch of the Conservation Station fleet in 2010, interns were integral to the program. Today there are three Conservation Stations in regular use, and the teams of interns go out with them for nearly every visit. As summer interns, there is no warmup period, the work starts on day one and keeps going throughout the ten-week term. Research projects are ready to go, Conservation Station events are booked, and since the university summer overlaps with the primary and secondary school spring semester, lending a hand with Water Rocks! school visits fills up the initial weeks. Interns are expected to know some, learn a lot of new, and be able to put new knowledge and skills to work immediately. Flexibility and learning on your feet are fundamental requirements. Some interns have noted that it’s about learning how much you don’t know and having fun filling the gaps. Over the years many have contributed to the ILF blog sharing their experiences. Intern duties include collecting water and soil samples, working under the direction of staff, faculty and graduate students, tabulating data, driving – and parking – trailers, participating in video projects, and staffing the Conservation Station. 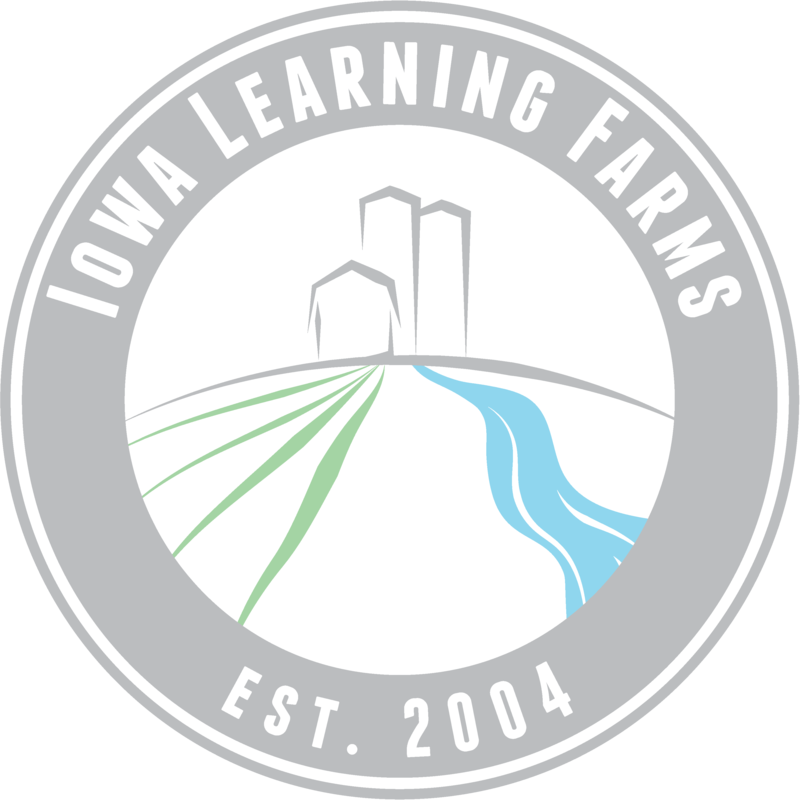 As representatives of Iowa Learning Farms in many venues, interns quickly become experts at listening, communicating and educating. A common theme we heard from our former interns was their development of stronger public speaking and communications skills. Leading or participating in a public event, county fair, or field day would bring them face to face with people of different ages and backgrounds. The audience diversity kept them on their toes in shaping the information to make sure they connected with the audience. Working with ILF provided many of our interns with valuable experience that they continue to use in their careers – even in fields beyond conservation and water quality. From teachers to manufacturing engineers, being a part of a team and communicating information, ideas and solutions are universal skills. One thing we’ve repeatedly observed at Conservation Station stops is that many of our adult audience members will seek out the interns just to talk. They seem drawn to the enthusiasm shown by these young adults in sharing their stories and connecting to people through excitement and hopeful messages. Many of these folks have a genuine interest in learning about the interns’ backgrounds, how they are doing in school, and where they see themselves after graduation. In fact, older citizens seem to prefer watching the young people present than the ISU-based professionals. And the interns truly appreciate the conversations and audience interactions as well. The other strong connection we see is with children in the audience. At field days and fairs young people are drawn to the goofy games and hands-on activities – but we see the parents and grandparents leaning in and learning along the way. And when they get into schools for Water Rocks! assemblies and outdoor classrooms, the interns have a chance to teach – and sometimes get stumped – by the next generation. When not on the road with the Conservation Stations, the interns also spend a good deal of time conducting hands-on research. Tasks range from taking water and soil samples to things such as counting earthworms. While these simple tasks are beneficial to ongoing research, there is also a lot of learning going on. Interns learn research techniques and gain an understanding of the importance of research processes and protocols to obtaining verifiable and repeatable results. In addition to the field research, interns have also helped conduct various social science research through the years helping with survey mailings and data collection as well as event evaluations. The event evaluations, in particular, demonstrate to the interns the importance of documenting impact on an event by event basis. Water Resources Interns are crucial to the ongoing success of ILF and Water Rocks! outreach and education activities. Every year they infuse the team with new energy, perspectives and ideas. The interns are there to learn and gain valuable career experience, but their contributions over the years have also helped make the programming and content better and more impactful for all constituencies. What does it take to become a Water Resources Intern? Enthusiasm to learn, enthusiasm to teach, and enthusiasm to engage with Iowans from all walks of life. We can teach them the content, but the spark and passion for sharing what they know and learning what they don’t is what makes for great interns and great experiences. Interns will be challenged with new ideas, new tasks and some exhausting days. We seek people who are passionate about conservation, the environment, water or soil quality, and agriculture. To learn more about the Water Resources Internship program, and for application instructions, please visit our 2019 Water Resources Internship Program page — applications close this Thursday, Jan. 31! This story was first published in Wallaces Farmer in December 2018. January 29, 2019 astaudt	college student, communication, Conservation Station, education, extension, intern, internship, Iowa Learning Farms, natural resources, outreach, soil, student, water, water resources internship, Water Rocks! The work that the Water Rocks! crew performs is truly amazing. Traveling to schools and teaching young students about ways to protect our natural resources is such a great thing. Every single one of our modules is on a different topic of conservation. Over the next several months, I’ll be sharing some insight into the different modules that we teach to our target audience of upper elementary and middle school students, to give you a behind the scenes look into how our classroom outreach programs roll! Our best module is our watershed presentation. We start off with introductions and a trivia/evaluation question, then we get right into it by explaining the definition of natural resources. After we have explained the definition, we ask the students to give some examples of different natural resources. When that is complete, we introduce our major word of the day which is watershed. We usually ask the students if any of them know what a watershed is. We then show them the definition and break it down in a couple different ways. First we have them cup their hand in front of them and we explain that the crease in the palm of their hand is a river, and their hand around it represents the land making up the watershed. We then have them “make it rain” on their hand/watershed and we ask them where all the water sheds off to. Another way to explain watersheds is with the concept of a cereal bowl and how the milk always flows to the bottom. Next we show the students that watersheds come in many different sizes. After that we show them a map of the US which contains the 4th largest watershed in the world by the name of the Mississippi River Watershed. This map helps the students see how all our waterways are connected and that everything we do on the land eventually affects our water. This concept is the main thing we are trying to get the students to understand. At this point we allow for the students to be creative with our game called We All Live In A Watershed! We give students a piece of riverfront property and an imaginary $5 million to build whatever they would like on their piece of land. When the students have completed their drawings, we go through a tour of the watershed and see what everyone had drawn. We continue on to then show them what the river water might have looked like in Iowa approximately 200 years earlier, and that our landscape was much different, primarily covered with tallgrass prairie. Fast forward back to today. We then discuss with students pollutants that could get carried into the water, such as trash, soil, chemicals, oil, and dog poop. We then start the second part of the game which involves the students picking the most prominent pollutant coming off of their piece of land. They then come up to the front and we give them a cup of water with our biodegradable example of the pollutant. After everyone has acquired their cup of water, we have the students one by one pour their cups into the jar representing the river, demonstrating that all of the water drains to one common point in a watershed, and to show how all the pollution has really affected our water. We then talk with the students about some of the different things they could do to help the current water situation – we’re all in this together and it’s really encouraging to hear their ideas of ways to keep the land and water around them healthy! We close with the same trivia/evaluation question that we asked in the beginning in order to gauge students’ change in comprehension after just a short 45-minute presentation. From our Water Rocks! 2017-18 School Visits Evaluation Report, 36% of students could correctly define a watershed prior to our classroom presentation. After our Water Rocks! lesson, 95% of students could correctly define a watershed.